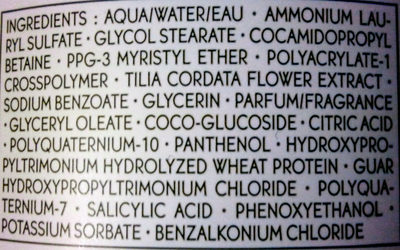 AQUA/WATER/EAU, AMMONIUM LAURYL SULFATE, GLYCOL STEARATE, COCAMIDOPROPYL BÉTAÏNE, PPG-3 MYRISTYL ETHER, POLYACRYLATE-1 CROSSPOLYMER, TILIA CORDATA FLOWER EXTRACT, SODIUM BENZOATE, GLYCERIN, PARFUM/FRAGRANCE, GLYCERYL OLEATE, COCO-GLUCOSIDE, CITRIC ACID, POLYQUATERNIUM-10, PANTHENOL,HYDROXYPROPYLTRIMONIUM HYDROLYZED WHEAT PROTEIN, GUAR HYDROXYPROPYLTRlMONIUM CHLORIDE, POLYQUATERNIUM-7, SALICYLIC ACID, PHENOXYETHANOL, POTASSIUM SORBATE, BENZALKONIUM CHLORIDE. Product added on November 19, 2016 at 9:17:26 AM CET by kipaul666. Last edit of product page on July 18, 2018 at 8:35:35 PM CEST by godiee.